That Tells You How To Win! 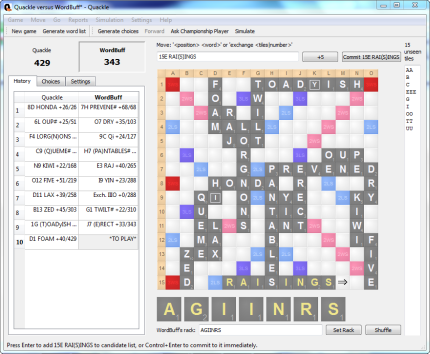 It's called Quackle, and it's not only a free Scrabble game, but also an artificial intelligence and analysis tool. What does that mean? Well, it means that not only can you play a free game of Scrabble with Quackle, but you can have it critique your game as well! At first glance, you can see it's got all the features you'd expect. On front stage, in the center of the screen, there's the main playing area, displaying a Scrabble board and rack. To the left of the board is the score-sheet recording all the plays, scores and sub-totals. And on the right there's a tile-tracking box - this tells you which tiles are still unseen from your perspective. Ok, as I said, that's pretty much what you'd expect. But the real fun starts in the analysis Quackle can do. Now I don't want this page to turn into a detailed tutorial, but let me just show you three key features that illustrate what I mean by 'artificial intelligence and analysis'. 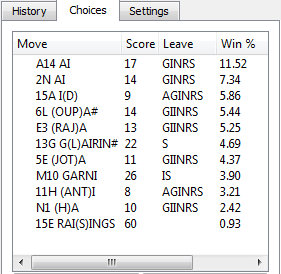 SECOND — I can ask Quackle to run a simulation, by playing itself hundreds (or even thousands) of times, and tell me how often each of these moves ends up winning. And herein lies the magic! Cool! Where Do I Get It? Ok, ok, here's a link to the free Scrabble player download page. NOTE — When I say Quackle is a free Scrabble game, I need to be careful with my terms. You see, the free bit is completely accurate, but the game is not technically (well, officially) Scrabble. 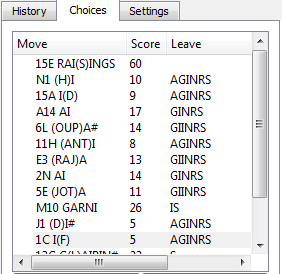 Quackle markets itself as a generic 'crossword game', but, as I just showed you, it can be configured to play just like Scrabble.